Read the winning entry here: "Arnhem Land vision for sanity in the city". Moral theologian Dr Frances Baker RSM has declared her judgment of the 2006 Margaret Dooley Young Writers Award. 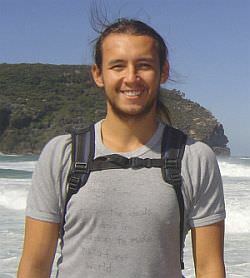 Winner 25-year-old Jonathan Hill, from Turramurra NSW, has won $2000, and will have his two entries published in the last edition of Eureka Street magazine for the year. "While not overtly Christian in its presentation, the issues with which this writer engages certainly reflect the human concerns of the Gospel," said Dr Baker. Eureka Street is very pleased to present the award to Jonathan, who has spent the last two years travelling between Darwin and Sydney, working with Aboriginal kids and volunteering with homeless people. The runners up of the 2006 award were Christine Kearney, for her article "A war, a crisis, a situation", and Angelica Hannan, for her article "The Debt of Nations". Each will receive a free subscription to Eureka Street, and will have their articles published in an upcoming edition of the magazine. "Both of these papers succeed in raising questions, in the mind of the reader, that extend beyond the content of the articles themselves," wrote Dr Baker. Two authors, Kristina Karlsson and John Cartner, were judged Highly Commended. "The work of these authors is to be commended," said Dr Baker. "Though different in style, the work of each certainly reflects a capacity to engage with ethical issues in contemporary society in a coherent and challenging manner." Overall, Dr Baker found it "very encouraging to find so many young writers prepared to engage seriously with the social and political issues of the day". "The submissions reflected concerns with both the Australian and World contexts and demonstrated an awareness of the variety of human situations in our world about which we each need to make a critical assessment," she said. "I congratulate these young writers on their readiness to use their particular talents in ways that might challenge the wider community to truly human living." Eureka Street would like to thank every entrant for their submissions, and invites them to enter the 2007 Margaret Dooley Young Writers Award when it opens next June/July. Watch this space! The judge's decision is final, and no correspondence will be entered into. I worked with Jonathan when he volunteered with the St Vincent de Paul Society in Darwin and I was thrilled to hear that his essays have been published. Darwin is a unique place and most definitely touches the hearts of all who visit here, Jonathan being a particularly special one. Congratulations! Thank you for such clear apprasial of the values expressed in the young writers' interests and actions. My offspring are of this age and hold such concerns. I feel that honest recognition is paromountin these times of distraction and regression. I really enjoyed reading Hill's book, The Big Questions - it was an easy read of a very complex subject.